We investigated the effect of varying sound intensity on the audiotactile crossmodal dynamic capture effect. Participants had to discriminate the direction of a target stream (tactile, Experiment 1; auditory, Experiment 2) while trying to ignore the direction of a distractor stream presented in a different modality (auditory, Experiment 1; tactile, Experiment 2). The distractor streams could either be spatiotemporally congruent or incongruent with respect to the target stream. In half of the trials, the participants were presented with auditory stimuli at 75 dB(A) while in the other half of the trials they were presented with auditory stimuli at 82 dB(A). Participants’ performance on both tasks was significantly affected by the intensity of the sounds. 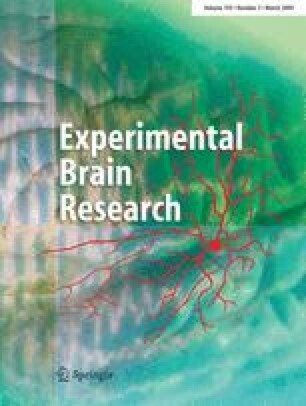 Namely, the crossmodal capture of tactile motion by audition was stronger with the more intense (vs. less intense) auditory distractors (Experiment 1), whereas the capture effect exerted by the tactile distractors was stronger for less intense (than for more intense) auditory targets (Experiment 2). The crossmodal dynamic capture was larger in Experiment 1 than in Experiment 2, with a stronger congruency effect when the target streams were presented in the tactile (vs. auditory) modality. Two explanations are put forward to account for these results: an attentional biasing toward the more intense auditory stimuli, and a modulation induced by the relative perceptual weight of, respectively, the auditory and the tactile signals. M.Z. was supported by a returning grant “Rientro dei cervelli” from the MURST (Italy).